While on various adventures in Alaska, the Zion served well as a one-stop-shop jacket. 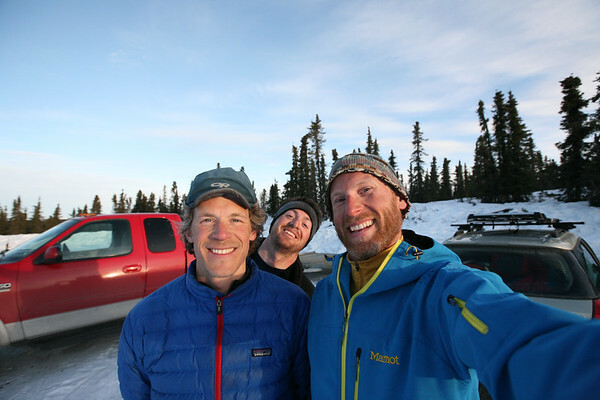 These adventures included a 112-mile sub-Arctic ski tour where fierce winds would howl across the Alaskan interior hurling icy snow; snowshoeing in Talkeetna where soft, though wet, flakes fell; and speeding across frozen lakes on snowmachines along the coastal Turnagain mountains. Each adventure provided different conditions and in each instance the Zion served so well I hardly noticed I was wearing it. My concerns with the jacket are minor, though it’s only fair to share. The whole jacket is fleece-lined and that’s great for everywhere except the hood. This will not be a concern for those who never wear any sort of winter stocking cap or skull cap. But with the hood up, as I looked down to check my boots or bindings or swiveled my head, my cap would stick to the interior of the hood and usually slowly get pulled off the back of my head. Easily fixed with a smooth interior hood fabric. The tight waterproof zippers are perfect for the level of weather protection performance of the rest of the jacket. But I found this tight zipper on the left upper arm made it difficult to use that pocket. So I didn’t. Maybe it was the dry nature of the high Rocky Mountain air or maybe it’s a common problem with soft shells, but for the first few weeks there was always a static charge jumping at me whenever I took the Zion off. It seems to have abated some but I don’t know if that’s part of the changing of the season or breaking the jacket in. Again, these concerns are minor and in no way take away from this being a quality product. I highly recommend it to any serious adventurer. Besides, it comes in some totally unforgettable colors. 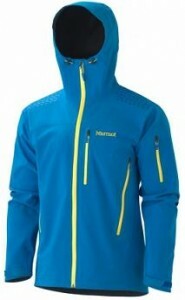 For more information on the Marmot Zion jacket, visit http://bit.ly/nU9Ueu. This entry is filed under: Blog, News, North America, Review, Snow, Story. That extra inch helps you out for sure!!! Darn stubby arms I have! Overall I really love the jacket . I do notice that its very crisp and tight at first, but I am breaking it in. The zippers are now much easier to use. Do you have any experience with the Arc'teryx venta sv? That was the other jacket I was looking to buy but decided to go with the Marmot. Ha! Yeah, I have stubby fat feet and it makes boot fitting interesting. I've never tried any of the Arc'teryx products. Did you try the Venta SV on and were the arms long on that also? thanks for reviewing this jacket, its given me the confidence to order mine (in the UK!) and will report back in the New Year after my ski and ice climbing trip to Scotland where the winds are fierce as patagonia. Great, Dan! Looking forward to hearing about the trip and how the jacket does for you! How tall are you? I am 5'10" and the medium is perfect yet the sleeves are abnormally long on this jacket. I'm 5'11″ and the sleeves fit me just fine in the medium. Great review! Thank you for sharing this. Hope to read more from you. Keep it up! What's the highest temperature you would go hiking in with this jacket? How waterproof is it? and how durable is it? I've been looking around to find some videos of testing or test results on durability and waterproofness, but can't seem to find anything. Also, how does it perform as an outer shell? and how does it compare to a hardshell? In high exertion activities where you are really breaking a sweat, how does this jacket compare in terms of breathability? You mention that this is really meant to be a winter jacket for near or below freezing temps, does this mean that the moisture wicking and breathability would be less effective in the 40, 50, or 60 degree (F) weather? I live in Anchorage, and I'm wondering if I would still want to wear just a normal hardshell while hiking in the rainy months of late summer, when temps are in the mid 50's to 60's. Even though this jacket is waterproof I wouldn't recommend it, or any softshell for that matter, as a primary rain jacket. The layers of fabric on the outside of the waterproof membrane will still absorb water and it will always take more time to dry out than a simple nylon hardshell that basically dries with a few good shakes and some sunshine/airflow/etc. If you're not camping that may not be as big of a deal to you. The moisture wicking isn't less effective in warmer temperatures, you're just more likely to perspire more in warmer temps, especially when wearing an insulating layer like this. This just creates more moisture to wick and my solution is usually to take the jacket off. If you're in a late summer downpour, breaking a sweat, it's going to be wet on both sides of the jacket and moisture wicking won't matter. At this point, again, I would just go with a nylon shell and save the softshells for the colder days and trips, like the ski tour I did north of Fairbanks (linked in story above). Thanks for your question! or the less-featured Kimtah jacket: http://www.rei.com/product/826021/rei-kimtah-rain…. eVent is a superior product for staying dry inside during exertion in cold OR warm and wet conditions compared to a fleecy soft shell like the Zion. The Zion pulls double duty as both a warm layer in winter, along with decent short-term rain resistance, but like Cam said — it will wet out pretty good in a deluge. Hardshells are always better for really wet outbreaks. If you still want to go Polartec NeoShell instead of eVent, RAB makes a hardshell NeoShell jacket along with a softshell stretch version that would be better for sustained outings in the rain. While I don't have a hardshell in the NeoShell fabric, I do own the REI Shuksan and can tell you it's a dream come true for spring skiing and and rain while hiking other times. You might find one cheaper than the other and base your decision on price without worry over performance. Thanks for the great review. Any ideas how this jacket would hold up while backpacking in inclement weather? Karl, I think it would do very well. It would need to be cold out (for me at least) because the nature of the soft shell is it is quite warm, especially while being active and doing something like backpacking. The jacket has some nice texture on the shoulders to help keep shoulder straps from slipping around and such. If you get it in some of that weather, come back and let us know how it did. Thanks! I have fairly broad shoulders and I fit just fine into the medium Zion. I can easily get a solid mid layer on underneath this and still be comfortable. I mostly skied in this jacket, I never got a chance to do any ice climbing where I would be bringing my arms up articulating my shoulders, but I never felt restricted by the jacket in being able to move my arms and be comfortable in the shoulders. As far as durability goes, I took a few good spills trying the crazy stuff I do while skiing and it held up to that well, even on the icy days. Never dragged myself along any rocks to see how it held up there. It has certainly become my one-stop jacket in that it can work in wide range of circumstances. I don't know that it has a full on fleece liner like you describe for the Genesis, but I wouldn't want that myself so I can choose my layering. Go try it on and let me know what you think.